From Disney’s new 2017 blockbuster release, Beauty and the Beast, comes Jarrod Radnich’s piano solo arrangement of “Evermore” — the movie’s spectacular ballad by Alan Menken and Tim Rice — inspired by the performance of Josh Groban and created with permission from Walt Disney Music Publishing. Musicnotes.com – the worlds leader in downloadable sheet music and for without their support, treatment insight, and belief in the importance of music and arts education… this project would not have been possible. Mason & Hamlin – builders of the world’s finest pianos (and a really great group of people who we are proud to call our friends). Walt Disney Music Company – for their support and approval of this project (and their creation of the amazing Cinderella movie with director Kenneth Branagh). Radnich releases first part of highly anticipated STAR WARS Piano Fantasy! 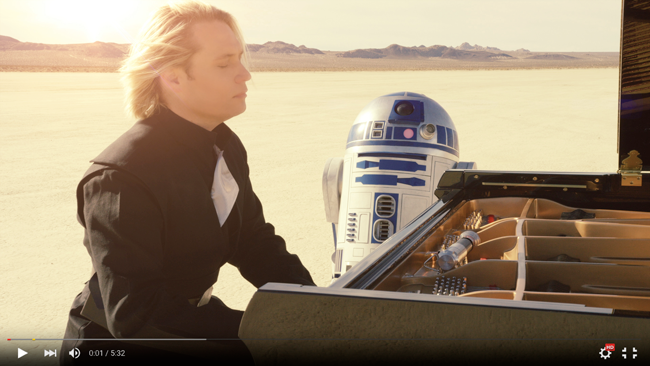 With over a half million views in the first week of the release, and being #2 for weeks on the sheet music charts worldwide only behind Adele’s Hello, Jarrod Radnich has released his highly anticipated first movement to his piano solo fantasy suite of iconic melodies from the epic STAR WARS original trilogy. With subsequent moments to follow, check-out this spectacular performance in the middle of the arid desert! Created with permission from Walt Disney Music Publishing. From Disney’s new 2015 blockbuster release, Cinderella, comes Jarrod Radnich’s piano solo arrangement of “Strong” — the movie’s spectacular ballad. 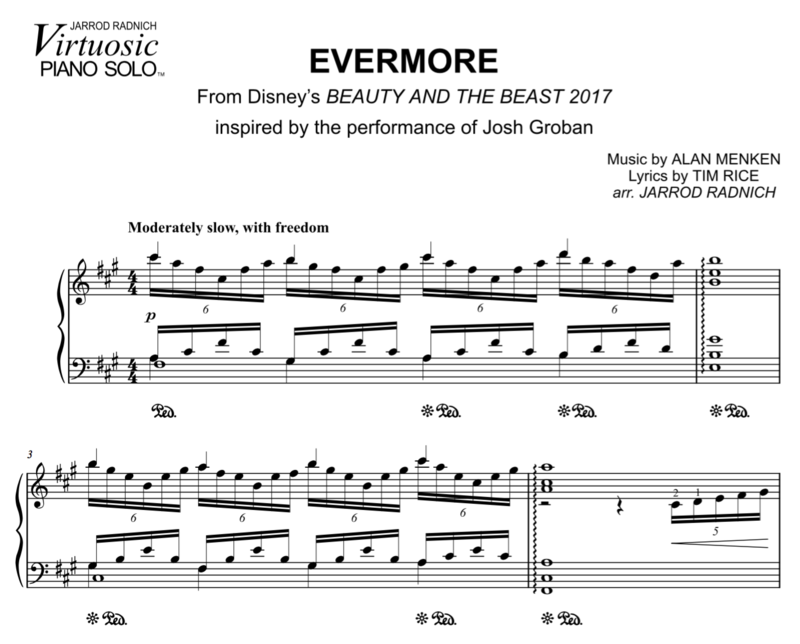 Created with permission from Walt Disney Music Publishing. All Rights for Patrick Doyle Music and Tommy Danvers Administered by Air-Edel Associates Ltd.
Radnich releases new Bohemian Rhapsody music video! Many thanks to Freddie Mercury (Queen) for his brilliant musical orchestration, “Bohemian Rhapsody” in 1975. This arrangement and performance by Jarrod Radnich travel from the sentimentalballad segment, to the quirky and fun operatic segment, to the “head banging” rock segment (with a nod to the famous Wayne’s World sing-along). SHEET MUSIC HERE: http://bit.ly/1lYTB6K at Musicnotes.com. EMI Glenwood Music Corp. obo Queen Music Ltd.
MADISON, Wis.–(BUSINESS WIRE)–With pianists abuzz for his virtuosic-level arrangements, composer, pianist, and music educator Jarrod Radnich, and Musicnotes, the leader in digital sheet music publishing, have partnered to meet worldwide demand as they build an extensive new collection showcasing Radnich’s advanced-level arrangements of popular works. While many traditional channels are seeing a decline in sales within the music products industry, mind the “Lisztian” Radnich and his arrangements are what some say is the force that is making the piano cool again. A keynote speaker at the 2013 National Conference on Keyboard Pedagogy, Radnich terms his arrangement technique as “Lisztening” in deference to Franz Liszt who, in the 1800s, rearranged for piano those musical works that were contemporary and popular at that time. Liszt’s arrangements and performances elevated the solo piano to previously unseen levels of popularity and spawned an enormous resurgence in piano study. Liberace admittedly followed Liszt’s model for piano performance as a social, interactive, and theatrical event, and now Radnich and Musicnotes are continuing what Liszt began nearly two-hundred years ago, but with an exciting twist. What neither Liszt nor Liberace had at their disposal was YouTube®, and the new team has embraced the visual aspects of performance to increase interest in and an understanding of the new arrangements. “Jarrod’s performances are visually and musically stunning and, as a pianist myself, seeing him actually perform his arrangements is extremely motivating. There’s an element of aspiration pianists feel when watching Jarrod play, and that ignites enthusiasm about practicing,” added Marsh. With that inspiration and motivation in mind, Radnich’s latest Musicnotes arrangement has been released simultaneously with another new YouTube® video…and it’s a blockbuster. Released just three days before the Emmy Awards, the piece is an original medley created from music made incredibly popular by HBO’s award-winning series, Game of Thrones, which had more Emmy nominations this year than any other show. Radnich performs donning a sword, arm bracers and full period-based attire, on top of a precipice over a rocky ocean shore, and with a few other cinematic surprises. To view the new Game of Thrones music video visit http://youtu.be/KkN4nCkvISc and purchase sheet music through Musicnotes at http://mnot.es/1p0zA9W. About Musicnotes: As the leader in downloadable sheet music, Musicnotes.com offers the best selection of 100% officially licensed and legal arrangements for nearly any instrument, genre and skill level. Founded in 1998, Musicnotes has transformed the way people purchase and play sheet music by fostering strong partnerships with music publishers, creating an ever-expanding catalogue of more than 260,000 pieces, and pioneering new technologies, like their top-rated sheet music apps for iOS and Android devices as well as Musicnotes Cloud. Musicnotes has sold more than 20 million downloads to more than 4 million customers since inception. For more information, visit www.musicnotes.com. About Jarrod Radnich: As president of Mastermind Studios, Jarrod Radnich creates high-end music content for listeners, musicians, educators, and those involved with cinema, gaming, and theater. Through his compositions and commended virtuosic piano solo performances, he claims the top position on Reverbnation as the most popular living independent classical/instrumental musician and has more than 80 million viewers worldwide. His is a co-inventor of PianoTube LIVE, and volunteers his time to be the maestro and arranger for the Joshua Tree Philharmonic, an intergenerational community orchestra. He also donates his time as the President and artistic director of the Hi-Desert Cultural Center. See www.jarrodradnich.com.